Do I have to cut down my trees? What is the average cost of the loan? How often do you need to replace the batteries - or do any repairs? How do solar panels fare during snow/inclimate weather? 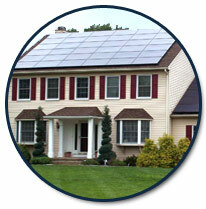 Does having a solar energy system on your home increase the value? 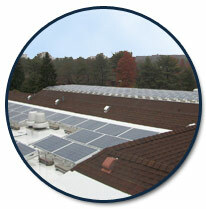 How does New Jersey's solar financing program work? How will SRECs reduce the need for solar rebates? 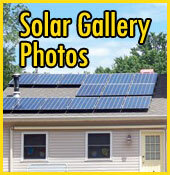 If you have questions that are not covered on our page, please feel free to contact A Clear Alternative Solar Energy (Toll Free): 1-888-577-8088 or email us by clicking here! The install time for a residential system is about 3 days. Commercial could be longer depending on the size of the system. The paperwork required before and after the install takes about 3 months total. Anything that shades the location of the array will need to be corrected. Obviously you will most likely not be able to move a chimney or a neighbor’s tree. If you are willing to cut your tree or even trim it that may be sufficient to remove whatever shade is hitting the roof. We conduct a shade analysis with a device called the Sun Eye. It tells us what if anything is shading the location of the array and how it will affect overall production. Solar panels will not work if covered with snow/ice. The good news is that because the modules are glass and installed at an angle most snow will eventually slide off. The modules are black or dark blue and absorb sunlight. So as the sun comes out the panels will get warm and melt whatever snow may be still on them. The panels and installation are engineered with the snow load calculated in. They will not get damaged from snow, ice, wind, or even 1” hail balls. The monthly loan payment depends on the system size and length of the term. In most cases solar will pay for itself in about 5 years and will last 30+ years. There are no batteries. Everyone is connected to the electric grid and if you produce more power than needed it is sent to the grid. When you need power at night you can pull from the credit you created earlier before you have to start paying for power. This is called Net Metering. There are no moving parts and no maintenance required by the manufacturer. Cleaning the modules is advisable annually, especially if covered with dust, pollen, bird droppings etc. that would block the sun from hitting the solar cells. Checking the array annually is a good idea to make sure there are no loose wires or connections and no squirrels or bird nests under the array. Solar modules are warranted for 25 years. Micro inverters are warranted for 25 years. Central inverters are warranted for 10 years. NJ requires all installers to warrant their workmanship for 5 years. Yes, Wells Fargo created a formula that allows us to calculate the increased value. Designed Solar System production in kWh x Current electric rate per kWh x 20 = Increased home value. kWh = kilowatt hours. A kWh is what are electric bills are based on. New Jersey's solar financing program relies on a combination of electricity cost savings through net metering, SRECs through the RPS marketplace, and rebates for small systems that complement federal tax credits, and depreciation benefits to reduce the total cost of installation and drive investment in solar. Historically, New Jersey's solar financing program relied heavily on up front rebates to provide up to 70% of the installation cost. A combination of SRECs and electricity savings provided through New Jersey's net metering regulations provide additional incentives that help bring the internal rate of return to approximately 12% or payback period to less than 10 years. SREC stands for Solar Renewable Energy Certificate and is a type of clean energy credit in the form of a tradable certificate useful for demonstrating compliance in state RPS markets. In New Jersey's RPS rules, an SREC is issued once a solar facility has generated 1,000 kWh (1MWh) through either estimated or actual metered production, and the SREC represents all the clean energy benefits of electricity generated from a solar electric system. SRECs can be sold or traded separately from the power, thus providing solar system owners a source of revenue to help offset the cost of installation. New Jersey's RPS requires that electric suppliers and providers retire SRECs in scale with their retail electricity sales in increasing amounts each year through 2020 and beyond. This long term demand for SRECs provides solar owners a predictable source of additional revenue that can facilitate long term financing for solar installations. SRECs provide an additional source of revenue and facilitate long term financing necessary to drive investment in solar. By increasing the value of SRECs, the rebate amount can be significantly reduced or eliminated, thereby reducing the annual impact of the program on ratepayers. New Jersey is recognized as a solar market leader with a model program that integrates one of the nation's best set of rules and financing programs for solar energy. 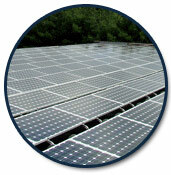 The BPU decision on September 12, 2007 to move to a market-based solar financing program and the policies and programs which resulted ensure the continued growth and health of New Jersey's solar market. New Jersey's decision to phase out rebates by 2012 and rely on SRECs to spur private investment and market development sends a strong message of fiscal responsibility and commitment to New Jersey's solar market and is a model for other states to follow. The price of an SREC is determined by a number of factors, including supply and demand for SRECs in any given year and the cost of SACP. Electric suppliers and providers (load serving entities) are required to pay a SACP if they do not meet the Solar RPS through purchasing SRECs. Generally, SACP levels are set by the BPU above the SREC levels necessary for electric suppliers to have an incentive to purchase SRECs instead of paying SACPs and necessary to provide an internal rate of return attractive for enough solar capacity to reach the RPS requirements. Historical SREC pricing information is recorded. In New Jersey, Electric Distribution Companies and third party electric suppliers are required to credit customers with solar systems or other renewable energy generators for each kilowatt-hour produced on an annual basis. The customer-generator reduces consumption for electricity with their renewable energy system during a monthly billing cycle with any excess generation being credited at retail rates on the following month's bill. Should excess generation accrue to the end of an annual period, the customer-generator is compensated for any remaining credits at the wholesale power rate by the Electric Distribution Company or their third party electric supplier. 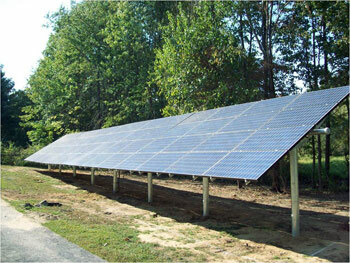 In New Jersey, all BPU-regulated Electric Distribution Companies and electricity suppliers offer net metering to their residential and small commercial customers that generate electricity on the customer's side of the meter, using Class 1 renewable energy sources, provided that the generating capacity of the customer-generator's facility does not exceed 2 MW and does not exceed the customer's annual electric consumption.